Support 2 modes: Miracast / DLNA (Airplay). 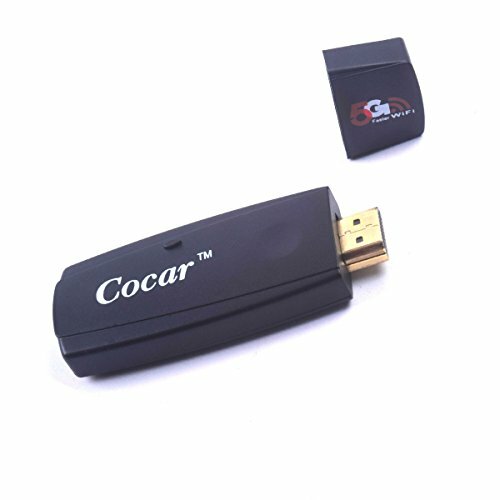 Newly upgraded Cocar 5G wifi miracast dongle brings you the most fluent experience of faster and more stable transmission. Very easy to setup to mirror your phone/tablet to the monitor/HDTV/projector via HDMI port. Get the best user experience on bigger screen with video/audio streaming from your smart phone/tablet. Watch video, online movies, play games, live camera, using apps etc.. Support HDMI 1.4; 1080P full HD output; Built-in 2.4G/5G Wi-Fi module with invisiable antenna. The Miracast DLNA HDMI TV Dongle supports both iPhone Airplay & Android .Max compatibilty for Android 4.2.2, IOS 6.1 above. It can be upgraded online and works well while Andriod, IOS systems are upgraded. If you have any questions about this product by Cocar, contact us by completing and submitting the form below. If you are looking for a specif part number, please include it with your message.